Every culture, say, every household (on the micro level) has their own version of any dishes. While others cook sweet and sour dishes like the Chineses' do, my siblings and I grew up to this this sweet dish that is often cooked by Mami on special occasions. 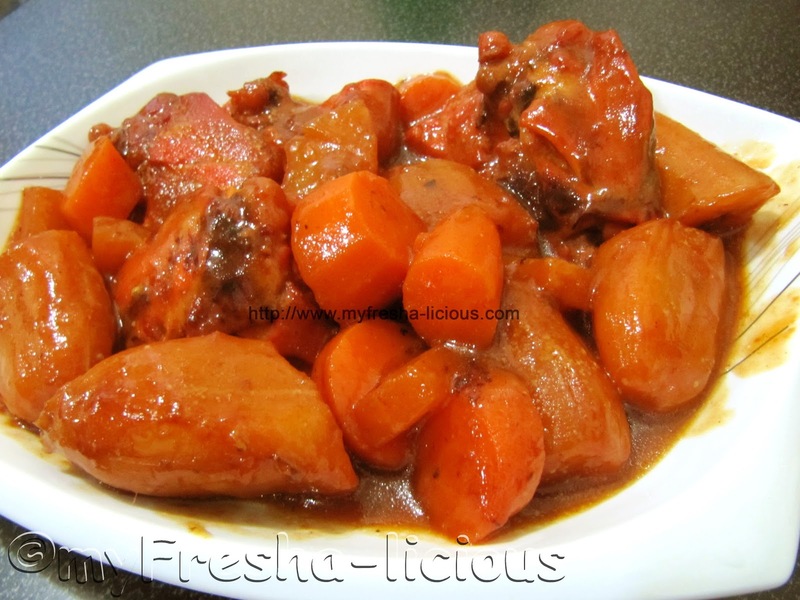 She calls it sweet and sour, but since sweetness overpowers her dish most of the time, I'm calling it a sweet stew. Mami cooks this dish with pork, potatoes, and pineapples, but without saging na saba (plantain). For my version, I am omitting the pineapple and adding the plantain instead. I love Mami's sweet pork stew when I was young, that I often look forward to it, wishing that there's a special occasion so she'll cook one. Now that I am an adult, I also don't cook this often. I cook it only once in a blue moon when I feel like cooking something sweet and orange in color that does not involve tomato sauce, tomato paste, or any tomato products.